As someone on a quest to visit all 50 states, the book Dishwasher: One Man's Quest to Wash Dishes in all Fifty States had me at hello. 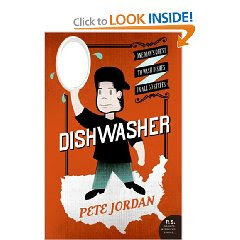 Pete Jordan AKA Dishwasher Pete, went on a decidedly unusual journey. My inner slacker loved this book. The book is so light and easygoing, it almost makes one wonder who wouldn't want to live such a carefree life? It felt like he was sticking it to the Man. Reader beware though: hearing about Dishwasher Pete's unique adventures and the truth about restaurants also made me think twice about eating out.